If you are an Owner or Manager of real estate in Florida, you should be receiving your 2018 TRIM (Truth in Millage) Notice within the next two weeks. The mailing of the TRIM Notice opens the 25 day window in which an appeal to the Value Adjustment Board can be filed. 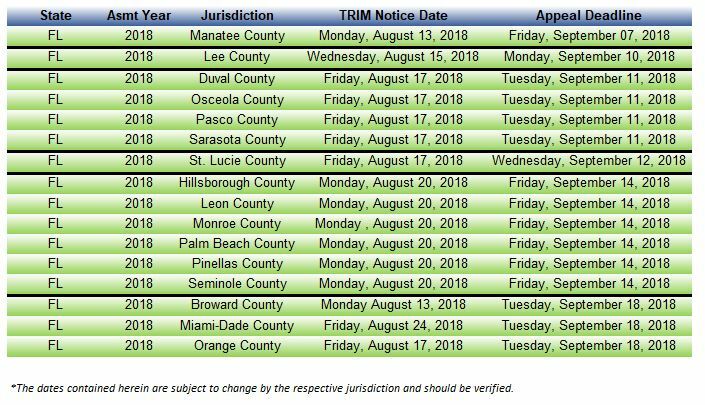 In the grid below, we have gathered the estimated dates for both the mailing of the TRIM Notice as well as the Appeal Deadlines for some of the major Florida Metro Counties. 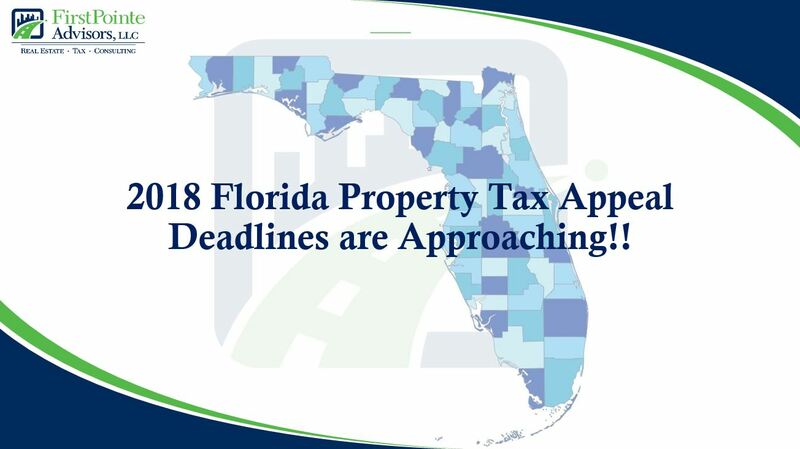 Additionally, if your County is not included below, our Resources page contains links to all 67 County Property Appraiser, Value Adjustment Board and Tax Collector websites to inquire about your respective county’s appeal deadline. The amount you will pay in property taxes for 2018 is directly based on the County’s opinion of market and assessed value for your property. If you feel the value is too high or just wish to have an independent review, then we encourage you to call us at (954) 282-2005 or email Brian at b.depotter@first-pointe.com or Nick at n.mau@first-pointe.com. Previous: Previous post: Property Owners, get ready for your TRIM Notice! Next: Next post: FirstPointe Advisors Managing Partner, Brian DePotter wins 2018 NAIOP Member of the Year Award!